IRCTC Login tutorials, news, guides, offers and more. Login to IRCTC and learn to book tatkal Tickets faster. Before you can book ticket on I.R.C.T.C Online Passenger Reservation System you must do IRCTC Login Registration Sign Up in order to enjoy the services of this online ticket booking provided by Indian Railways. with steps that will help to register yourself on this site and complete your sign up or registration procedure. Open irctc.co.in in your browser and Click on sign up link below the login form. Do not click on this image, just go to www.irctc.co.in and click on the Signup link below the login form. A new page will open along with the registration process form asking for your details to create your IRCTC account. The form will look like given below image. Enter the details in form as asked. Username means any name or short word that you will need to enter when during login. This is the user id which asked at login. Do enter a working mobile number in the registration form because they may verify your mobile number by sending a pass code. After filling the form correctly and image captcha click on submit. You will receive your details in your e-mail along with the password. You can also change your password later. After successful activation of your account, you can change your password through ‘Change Password’ link or you can use the same password which is received through mail. View the Youtube Video below for the steps. This will make you understand better. 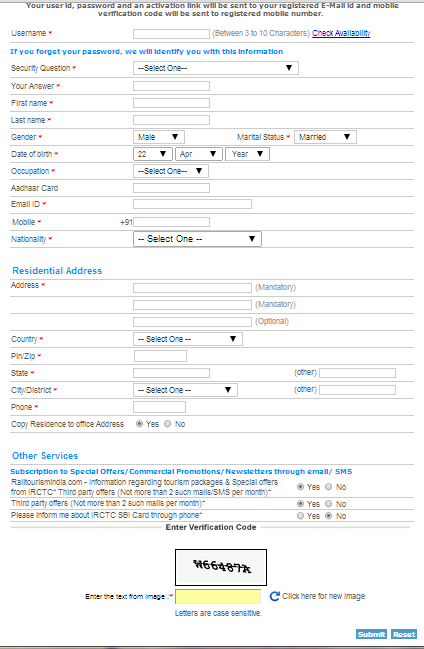 It shows the tutorial where you can find the irctc sign up registration form and fill in your details. This is the IRCTC Registration process. If you are having any problem or difficulty you can comment below your queries and we will help you sort out your problems. For foreigners and NRIs who want to create an ID at the online train ticket booking website there are some rules you have to follow. It is not easy to create a customer ID without Indian phone number. You have to apply and submit the scanned copy of your passport on the website. After this, there is an approval process and if you get verified then the password will be sent to you mail. If you face any problem you can always mail to care@irctc.co.in. Having an account on irctc is not just enough to have your problems solved there are lot more hurdles that are required to be crossed. One of the most important thing to learn to master is booking Tatkal tickets faster than anyone. At least learning to book a seat for yourself. You need to try to intimidate yourself to get you tatkal ticket booked. If you are unable to create account in IRCTC like you are facing problems regarding username, email ids already existing or password errors. www irctc login create new account do let us know, we will surely try our best to help you out. Where to Find Best Scholarships For Indian Students? Well its redirecting to the Irctc registration form. You should check it once more or may be there is some problem on your side. It is not working. Frm where should i register ? If you already have an irctcaccount and you have logged in reviously, do clear your cache, history and cookies. Then click on sign up button. I checked through my pc and mobile and its working fine. How to find Transaction ID ? If you have same email ID and mobile number, all you need to do is just search for your first email from IRCTC in which they have quoted your userid. Now you have user id. Go to irctc.co.in and click on forget password. Enter your user id and you will receive a password reset email at ur registered email address. Hope it helps. Also, you cannot make new ID with an already registered email and mobile number. I forgot my password for irctc account and I tried to retrieve it using forgot password link but getting error "your password could not be resolved ". Try to login with user id you have used to sign up. If it says wrong id and password. Follow forgot password link. Transaction id is given in the bank account statement. I completed the registration form but ultimately when I click the button 'submit' nothing happens. Neither have I received any password on the email or mobile. This is a technical glitch on irctc side (since some other user comments above mention same problem). What is the solution? After registering people instantly try for Tatkal bookings/ reservations. Tickets in the tatkal amount are opened for booking, 3 days before the adventure date. This permits you to have a tolerable opportunity to get a spur of the moment train reservation. Notwithstanding booking tickets, you can likewise check your PNR Status, perspective Seat Availability and Railway train plan. You can likewise ascertain passage for any particular prepare or class. IRCTC lite adaptation is the latest expansion to the site's framework. Because of the enormous movement volume amid tatkal enlistment period, page takes a few minutes to load and also sign up has increased a lot. This lite adaptation enhances the stacking speed essentially by uprooting pointless pictures, joins, ads e.t.c. my adhar number,email I'd and phone no. is correct but it's showing wrong always. .what to do..??? Someone else must have used your details. Specifically AADHAR card during irctc registeration he entered wrongly yours. Explain it a little more please. What problem are you actually facing while sign up. Do you get any error? Why? What problem you are facing. 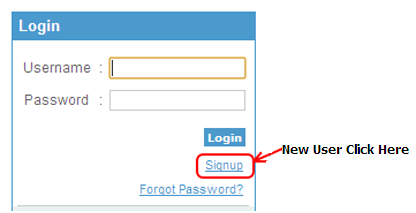 First go to irctc.co.in and then click on Sign Up link given below the login form. There is some problem with the people registering outside India. Please mail to care@irctc.co.in for details and complaints. All you get if you email >care@irctc.co.in< is another automated reply no help. I have been trying for 6 days and just get a new ticket number to quote. Same email mobile will not work. Click on forgot password link below the login form to get your password again. "You are not allowed to recover your password as your account is de-active"
IS there any way to reactivate my DE-ACTIVAED User ID? aap galt bhar rahe honge form ya phir is time irctc ne registration band rakha hoga. I, my Id is silcortez. Im trying to verify my mobile number to use my account, but i ve tried it many times unsuccesfully. I havent had any message. My email is already verified but i never receive a request for my scanned passport . Mi mobile number is +5492615054273 and it is active in argentina. Would you be nice to help me and let me know what i have to do? Thanks! The same thing is still happening. I am in Australia and have tried for the past 6 days to get the OTP for mobile to complete the registration. I got the OTP for email immediately so have completed that part but can’t use the site until the OTP for mobile is sent. I am having the same problem as Silvana January 14th 2018.I am in Australia and have tried for the past 6 days to get the OTP for mobile to complete the registration. I got the OTP for email immediately so have completed that part but can’t use the site until the OTP for mobile is sent. What can I do to fix the problem.